Islamabad: Traders of Blue Area have rejected the energy conservation measures announced by the government terming it against their interests. Closure of markets amounts to economic murder of trading community therefore it will not be allowed and any such move will meet our resistance, they said. This decision was taken in a meeting attended by hundreds of traders and many business leaders including Amin Pirzada, Liaquat Ali Noon, Yusuf Rajput, Haji Muhammad Naeem, Imran ul Haq, and Raja Hassan Akhtar. Speaking at the occasion outgoing Chairman of Traders Welfare Association Malik Sagheer said that such decisions have proved useless in past and it has added to trouble of masses and business community. He said that government is busy in experiments which proves that they have nothing concrete in mind. Sagheer said that he will continue to serve masses after his term and lauded the role of outgoing President Malik Sohail Hussain. He said that Sohail brought Blue Area on the map and tried best to serve the community. At the accession Malik Sohail said that his doors will be open for the business community as his new engagements would not keep him from Blue Area. "I am available for any accountability," he said. 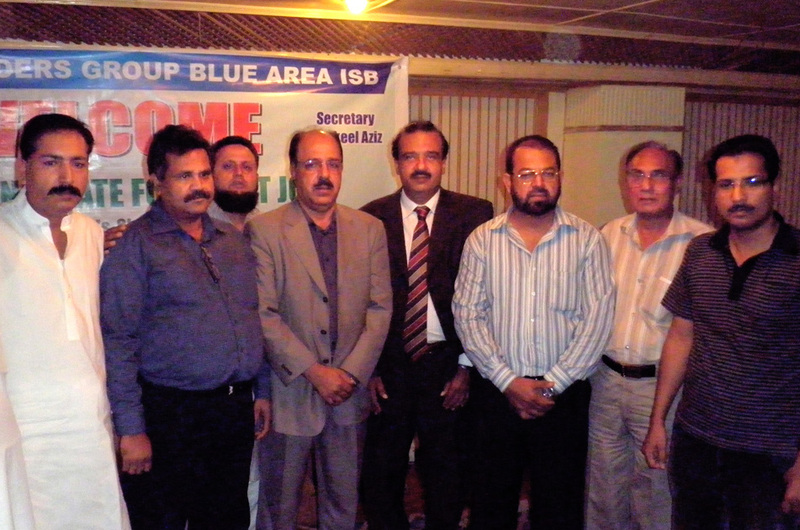 At the occasion capital Group nominated Nadeem Mansoor as new president of the Blue Area while Shakeel Aziz was nominated as General Secretary. Speaking to the traders, Mansoor and Aziz said that they would continue to serve and defend trading community. We will follow the footsteps of Malik Sohail and seek guidance from him in critical matters. Traders unanimously vowed to resist unilateral moves of the government.